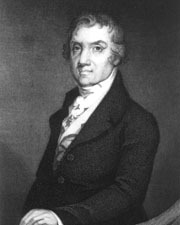 BALDWIN, Abraham, (half-brother of Henry Baldwin of Pennsylvania), a Delegate, a Representative, and a Senator from Georgia; born in North Guilford, Conn., November 22, 1754; moved with his father to New Haven, Conn., in 1769; attended private schools; graduated from Yale College in 1772; subsequently studied theology at the college and was licensed to preach in 1775; served as a tutor in that institution 1775-1779, when he resigned to enter the Army; chaplain in the Second Connecticut Brigade, Revolutionary Army, from 1777 until 1783, when the troops disbanded; studied law during his service in the Army; admitted to the bar in 1783 and practiced at Fairfield; moved to Augusta, Ga., in 1784 and continued the practice of law; member of the State house of representatives 1785; originator of the plan for, and author of, the charter of the University of Georgia and served as president 1786-1801; member of the Continental Congress 1785, 1787, and 1788; delegate to the Federal Constitutional Convention in Philadelphia in 1787 and one of the signers of the Constitution; elected to the First and to the four succeeding Congresses (March 4, 1789-March 3, 1799); elected to the United States Senate in 1799; reelected in 1805 and served from March 4, 1799, until his death on March 4, 1807; served as President pro tempore of the Senate during the Seventh Congress; died in Washington, D.C.; interment in Rock Creek Cemetery. Dictionary of American Biography; Furlong, Patrick J. Abraham Baldwin: A Georgia Yankee as Old-Congress Man. Georgia Historical Quarterly 56 (Spring 1972): 51-71; Coulter, E. Merton. Abraham Baldwin: Patriot, Educator, and Founding Father. Arlington, VA: Vandamere Press, 1987.